First catalogued by Edmund Halley in 1677, Eta Carinae is one of the most massive and most visible stars in the sky. It is composed of two parts, Eta Car A, the primary star and Eta Car B, the secondary star. The star is 7,500 light-years away in the constellation Carina. Because of the star’s extremely high mass, it is unstable and uses its fuel very quickly, compared to other stars. Such massive stars also have a short lifetime, and it is expected that Eta Carinae will explode within a million years. Eta Carinae, one of the most massive stars in our Milky Way galaxy, unexpectedly increased in brightness in the 19th century. In 1843 Eta Carinae was one of the brightest stars in the sky. For ten years it was the second-brightest star in the sky. It then slowly faded until, in 1868, it became invisible in the sky. Eta Carinae started to brighten again in the 1990s and was again visible to the naked eye. Around 1998 and 1999 its brightness suddenly and unexpectedly doubled. The increase in luminosity was so great that it earned the rare title of Great Eruption. New research from a team including Carnegie's Jose Prieto, now at Princeton University, has used a "light echo" technique to demonstrate that this eruption was much different than previously thought. Their work is published Feb. 16 in Nature. Eta Carinae is a Luminous Blue Variable (LBV), meaning it has periods of dimness followed by periods of brightness. The variations in brightness of an LBV are caused by increased instability and loss of mass. The Great Eruption was an extreme and unique event in which the star, which is more than 100 times the mass of the Sun, lost several times the mass of the Sun. Scientists have believed that this rare type of eruption was caused by a stellar wind. 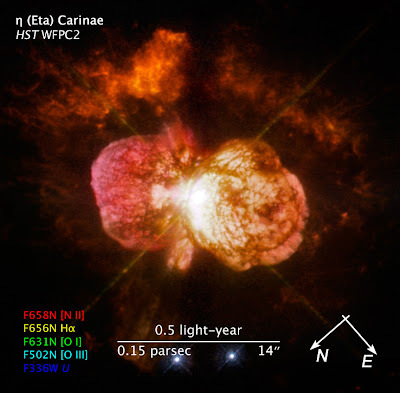 The team of scientists, led by Armin Rest of the Space Telescope Science Institute, used images of Eta Carinae over 8 years to study light echoes of the Great Eruption. For the first time, they observed light from the eruption that bounced, or echoed, off interstellar dust tens of light years from the star. Those extra tens of light years mean that the light is reaching Earth now rather than in the 1800s when people on Earth observed the light that traveled here directly. They then used the Magellan and du Pont telescopes at Las Campanas Observatories, in Chile, to obtain spectra of the echoes of light. The spectra allow them to precisely separate the light into its constituents, much like a drop of rain naturally acts as a prism and separates sunlight into the colors of the rainbow. These observations give important information about the chemical composition, temperature, and velocity of the material ejected during the 19th century Great Eruption. Most surprisingly, their observations show that the Great Eruption is different from so-called "supernova impostors," events in nearby galaxies that are thought to be eruptions from LBVs. For example, the Great Eruption was significantly cooler than allowed by simple stellar-wind models used to explain supernova impostors. "This star's Giant Eruption has been considered a prototype for all supernova imposters in external galaxies," Prieto said. "But this research indicates that it is actually a rather unique event." Thus, scientists still don't know what phenomenon caused Eta Carinae to erupt and lose such a quantity of mass without being destroyed. Further research is necessary to determine whether other proposed models could have triggered this activity instead.